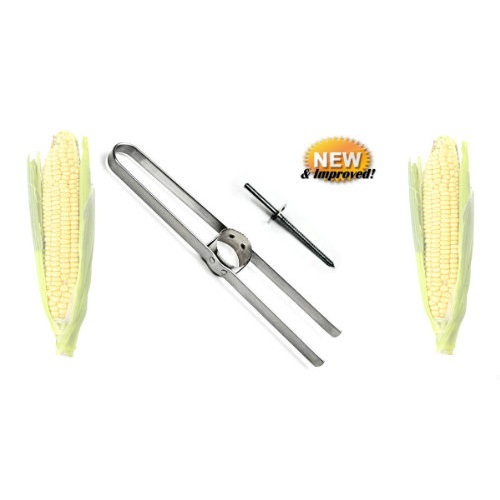 Made in America, this handy device will effortlessly cut whole kernel corn off the cob. Because the handle is made of powder coated metal, it is durable. Kerry's Kernel Kutter Kit is an affordable corn cutting option. Rather than being made of cheap fiberglass that splinters over time, the American made handle is powder coated metal. Since the handle is metal, the cutter needs only one rivet on each side to stay in place. Therefore it can open wider and adapt to the cob much easier. The cob screw is another American made tool that is the ideal length. With deep grooves, the screw is inserted easily, and the cob stays in place.